As we head off into the first weekend of spring, let’s take another look at Harmon Jones‘ Bloodhounds of Broadway (1952). Emily Ann Stackerlee (Mitzi Gaynor) has dissuaded her erstwhile fiance Crockett Pace from shooting Numbers Foster (Scott Brady) and Poorly Sammis (Wally Vernon), but Pace remains skeptical. Ms. Gaynor is without question one of the greatest stars of musical theater who ever lived. She’s been tearing up the Broadway stage almost her entire life. She only appeared in films for thirteen years; television and the stage seem to be her preferred venues. At 82, she’s still packin’ ’em in at her one-woman show, Razzle Dazzle! My Life Behind the Sequins. Go get ’em Mitzi! 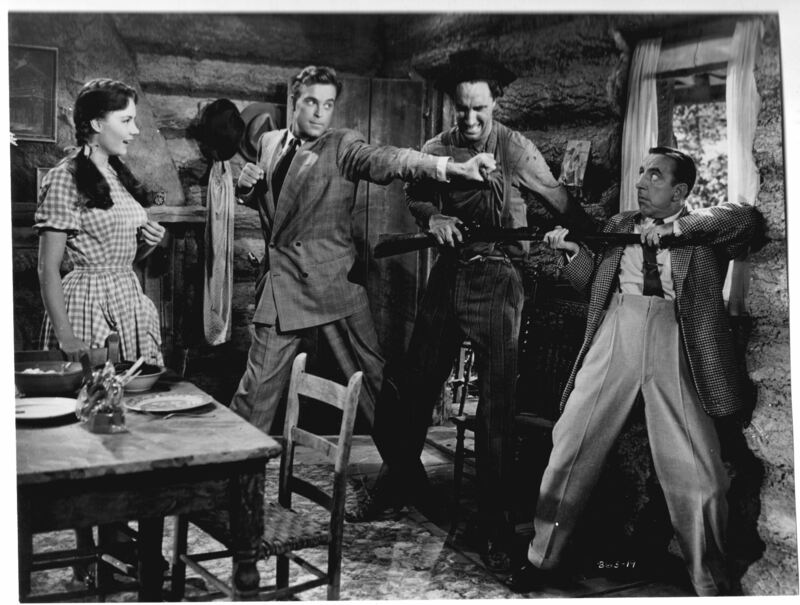 In celebration of the birthday anniversary of the late great Scott Brady, born this date in 1924, today’s pic is a publicity still from Bloodhounds of Broadway (1952), the only film he and Timothy made together. 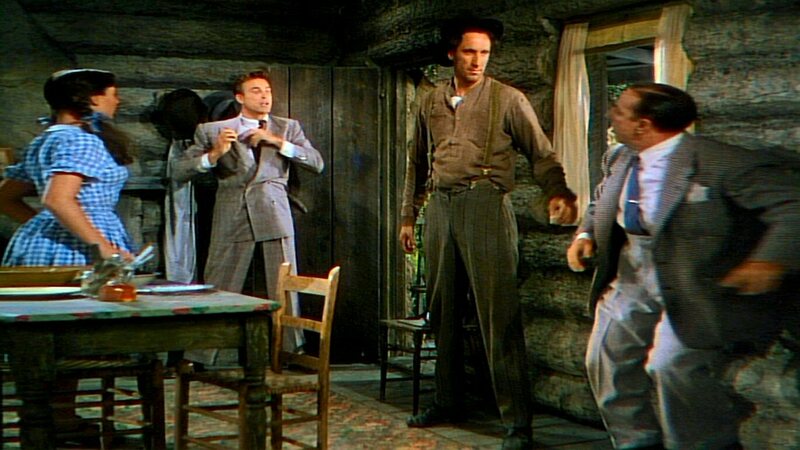 Tim, unbilled as hillbilly Crockett Pace, is attempting to get rid of city fellas Numbers Foster (Brady) and Poorly Sammis (Wally Vernon), intent on spiriting away his intended, Emily Ann Stackerlee (Mitzi Gaynor). Brady, born Gerald Tierney in Brooklyn, was one-third of the cinematic Tierney brothers, the others being Lawrence (1919-2002) and Edward (1928-1983). He enjoyed a long career as a good-looking tough guy in films and on television. He passed away in 1985 from complications of pulmonary fibrosis. There aren’t too many like him left, unfortunately for us. Happy afterlife birthday, Scott! 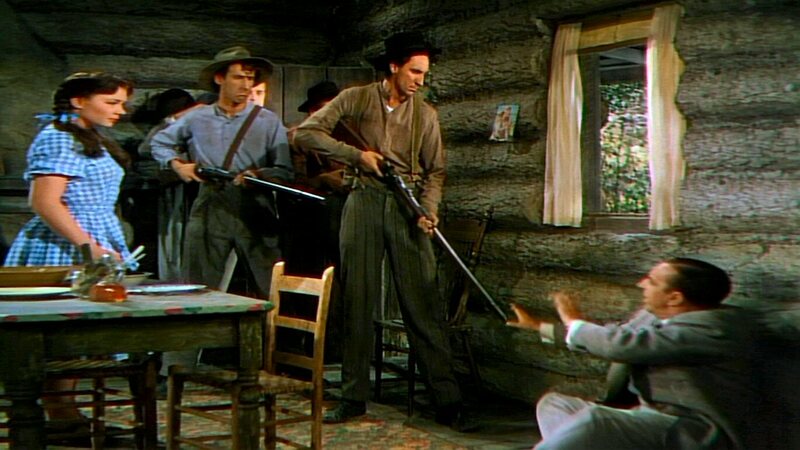 Today’s pic takes another look at Bloodhounds of Broadway (1952) and one of Timothy’s first speaking parts, hillbilly gunslinger Crockett Pace. 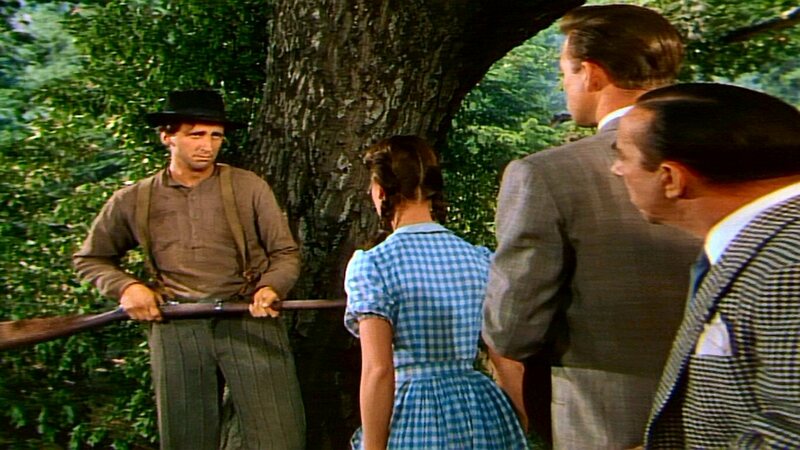 He and his kin are not appreciating Poorly Sammis’ (Wally Vernon) notion of making a Broadway star out of his intended, Emily Ann Stackerlee (Mitzi Gaynor). Numbers Foster (Scott Brady) is about to come to the rescue. Tim did the best he could with this small, uncredited part, which was quite a lot, actually. Another example of him rising above the material to create a memorable character. Today’s pic is a rather roundabout way of celebrating the birthday anniversary of Timothy’s good friend, the fabulous (and notorious) Lawrence Tierney. Unfortunately, they never made any films together. 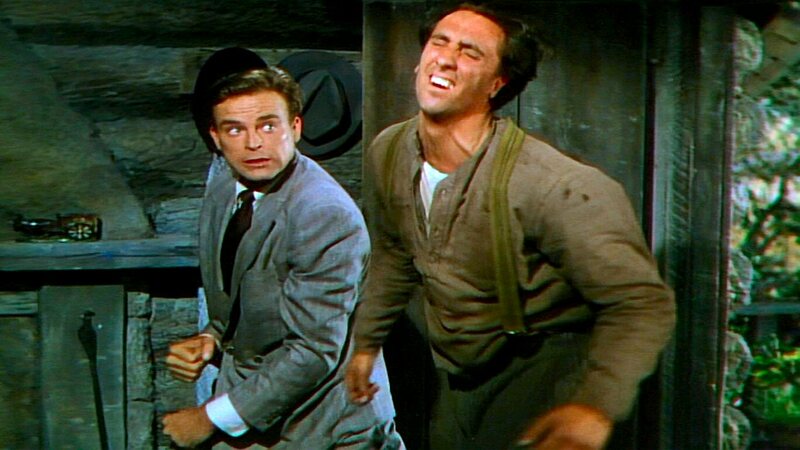 However, Tim did appear in Bloodhounds of Broadway (1952), where, as we can see here, he has an unfortunate encounter with the fist of Scott Brady, Tierney’s brother. How’s that for several degrees of separation? Our pic for today features Tim in one of his first speaking roles. 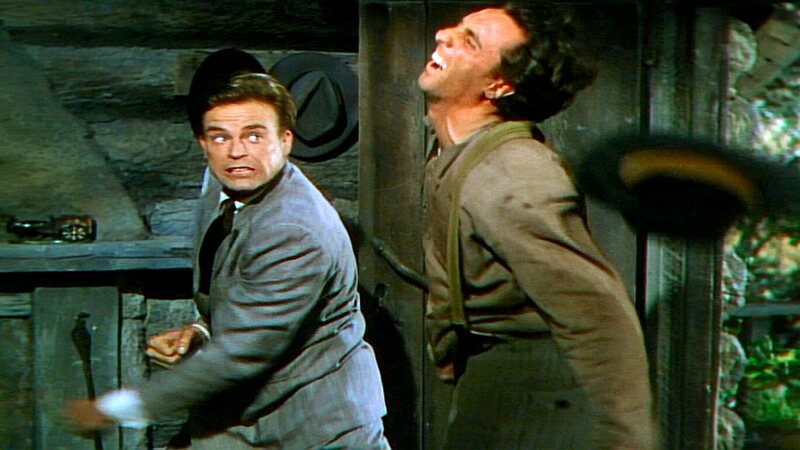 Bloodhounds of Broadway (1952) was a musical comedy directed by Harmon Jones and based on the writings of Damon Runyon, who co-wrote the screenplay. Tim unfortunately (or fortunately, depending on your point of view) doesn’t get to sing, but he does make an impression in the uncredited role of Crockett Pace, Mitzi Gaynor‘s hillbilly suitor. He is about to get spectacularly punched out by fellow Brooklynite Scott Brady, brother of Lawrence Tierney, who later became a good friend of Tim’s.